You are here: Home / Blog / Cake! Here it is, as promised. In order to appreciate this miracle, you must have read my previous post, From the Writers Cave. In cake class this week we learned to do a shell border, the flowers on this cake, how to make clown bodies in which you stick a plastic clown head. (I don’t know if I’ve already shared my strange dislike of clowns in all forms, but let’s just say there was no way I was putting a clown on my cake. I did it on a piece of waxed paper and promptly tossed it as soon as it was finished and approved by my instructor.) We also learned how to make a decorating bag from parchment paper. Very cool skill, I might add — saves tons of clean up. Oh yeah, we also began our instruction on making roses. Now that was fun. Any way, here’s my finished product, level and all in one piece. Drum roll, please. It’s not great, and certainly not as good as my daughter’s, but it’s a huge improvement for me! My chocolate frosting was really too soft to do a proper shell border on the base. Live and learn. I’m missing next week’s class. So it’ll be a while before I can (hopefully) share further progress. 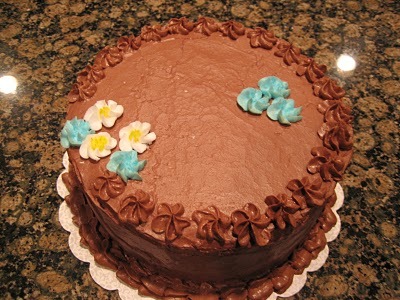 Thank you for visiting Susan’s cake creations and have a great day.